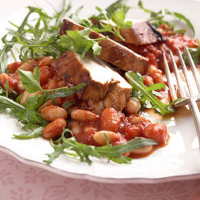 This simple dish provides a big whack of flavour – the balsamic vinegar adds a sweet-and-sour interest to the chicken, and paprika spices up the beans – making this a satisfying choice for a mid-week dinner. Mix the mustard, olive oil and 2 tbsp balsamic vinegar, and toss the chicken breasts in the mixture until well coated. Preheat the grill. Grill the chicken breasts, turning once, for 12–15 minutes, till cooked through. Meanwhile, drain the beans and put them, the garlic, the tomatoes and their juices and the paprika in a pan and season. Heat, then add the clear honey and 50ml water. Simmer for 10 minutes until thickened (you can mash a few of the beans to thicken it more). Divide the beans between warm plates and scatter with the parsley. Slice each chicken breast and arrange on top. Drizzle with the remaining balsamic vinegar and scatter over the rocket. Rhone red wine is deep-flavoured enough to cope with the balsamic tang yet round and warm enough to lift the chicken and beans.